NASA’s Curiosity rover looks back to ramp with 4th drill site target at ‘Bonanza King’ rock outcrop in ‘Hidden Valley’ at site marking her 2nd anniversary on Mars, as shown in this photo mosaic view captured on Aug. 6, 2014, Sol 711. Note the rover’s partial selfie, valley walls, deep wheel tracks in the sand dunes and distant rim of Gale crater beyond the ramp. Navcam camera raw images stitched and colorized. Not wanting to get stuck in a rut, Curiosity’s handlers have commanded NASA’s SUV-sized rover to reverse course and drive out of a potentially hazardous Martian valley of slippery sand with poor wheel traction and instead backtrack towards an enticing nearby spot that the team feels could be the fourth candidate for rock drilling – and thereby widen the scope of the story of habitable environments on the Red Planet. The new drilling target under up close evaluation right now is named ‘Bonanza King’ – shown in our photo mosaic above. Bonanza King was chosen after the six wheeled rover unexpectedly experienced significant wheel slippage in the past week while driving over an extended dune field of sandy ripples that basically stopped forward movement inside the Martian valley. The team was thus in a quandary over whether to push forward on a route through the loose sands of “Hidden Valley” and possibly risk getting mired in a hidden sand trap or drive backwards over a field of sharp rocks on the “Zabriskie plateau” and beyond that are certain to tear further holes in the wheels. As reported here last week on the occasion of her 2nd anniversary on Mars since the dramatic touchdown inside Gale Crater on Aug. 6, 2012, Curiosity had been driving merrily through the supposed safe valley of sandy ripples of “Hidden Valley.” She was approaching a bedrock unit named “Pahrump Hills” that for the first time is actually part of the humongous mountain named Mount Sharp she will soon scale and which is the primary science destination of the mission. But rather soon after driving over a low hump from Zabriskie plateau (see our mosaic below) into Hidden Valley, the robot experienced wheel slippage in the ripples of sand filling the crater floor which was much higher than anticipated. And even worse than comparable test drives in a practice sand lot at JPL. Curiosity rover looks back to the rocky plains of the Zabriskie plateau from sandy ramp into ‘Hidden Valley’ with 4th drill site target at ‘Bonanza King’ rock outcrop as shown in this photo mosaic view captured on Aug. 14, 2014, Sol 719. Sharp edged rocks at Zabriskie tore new holes into rover wheels. Navcam camera raw images stitched and colorized. The sandy ripples extend out to the sloping valley walls with no end in sight. “We need to gain a better understanding of the interaction between the wheels and Martian sand ripples, and Hidden Valley is not a good location for experimenting,” said Curiosity Project Manager Jim Erickson of NASA’s Jet Propulsion Laboratory in Pasadena, California, in a statement. 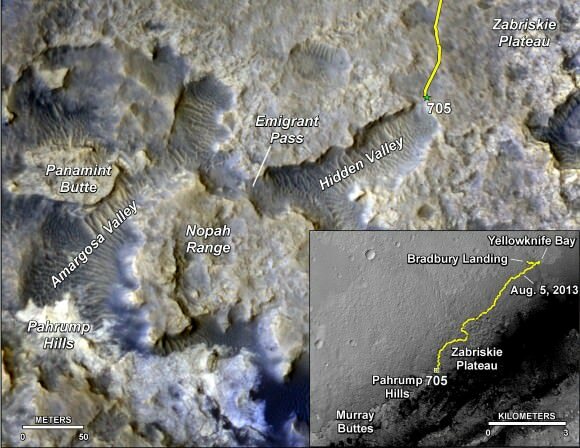 And since Hidden Valley is as long as a football field and has only two navigable exits at the northeastern and southwestern ends (see map below), the team was forced to drive back to the entrance way at the northern end to consider an alternative route forward to the base of Mount Sharp. In the meantime while they evaluate the way forward, the team decided that Bonanza King offers similar science to what scientists anticipate at the outcrops at “Pahrump Hills”- a preview of a geological unit that is part of the base of Mount Sharp for the first time since landing rather than still belonging to the floor of Gale Crater. “Geologically speaking, we can tie the Bonanza King rocks to those at Pahrump Hills. Studying them here will give us a head start in understanding how they fit into the bigger picture of Gale Crater and Mount Sharp,” said Curiosity Deputy Project Scientist Ashwin Vasavada of JPL, in a statement. Bonanza King sits in an bright outcrop on the low ramp leading in and out of Hidden Valley. It looks like a pale paving stone. Since its location within the geological layers visible on the ramp is similar to what was expected at the Pahrump Hills outcrop, it’s very appealing to the science team. Furthermore when one of the rovers wheel’s drove over the outcrop, it cracked open one of the rocks and exposed bright interior material, possibly from mineral veins – which is super exciting from a science perspective as a potential marker for flowing liquid water. Right now the team is collecting spectral data with the science instruments to assess its science utility and is planning a super fast drilling campaign, far shorter than the prior three. The plan would be to core a sample from the interior of the dinner plate sized rock slab for delivery to Curiosity’s pair of the onboard chemistry labs, SAM and CheMin to analyze for the chemical ingredients to support miartin microbes, if they ever existed. “This outcrop on the ramp is too appealing to pass up,” Vasavada said. I’m guessing that the larger mass of Curiosity drove the wheel design which seems far more fragile than those on previous rovers. Surprised that this vulnerability was not caught in the design review phase. Given the complex nature of this mission and its very difficult landing routine, seems rather incredulous that something as basic as “determining adequate tire durability” could turn out to be the fly in the ointment. Ditto on that philw1776. You would think that knowing the rover is approx. 1 ton (2,000 lbs) on Earth and 750 lbs on Mars (Approx. 3/8 the gravity), the wheels would have been specifically designed to hold up better? Bygones, work with what you have… right? Pahrump Hills eh? Back in the late 1970’s my Popster purchased a couple acres of desert land in the Pahrump Valley, some 70 miles north of Las Vegas. The intention was to create a living space for those who suffer from environmental contaminants and have experienced subsequent immune deficiency diseases. So.. they bought several old trailers, which did NOT have vinyls or other synthetic materials in their make up and moved on in and found it was too hot.. too dusty and far too remote. Had problems. So they sold out. The trailers went to a local brothel… LOL! That valley is VERY interesting in that there are these 20 foot tall mounds all around. The mounds are the remains of ancient Cottonwood trees. The root systems kept the soils intact and created the mounds when the top soils blew away. They are estimated to be several hundred years old and from a time when the Pahrump Valley was much wetter, as was the whole southwestern part of the country. Developers moved in and made a gold course, dug wells and pumped millions of gallons of ground water to wet the greens. Dzzzzz.. golf courses… THAT probably didn’t help ? Regardless, am curious as to why that feature on Mars was named after? Any info. on that? I’ve been wondering that as well. If it IS named after the Nevada city, the coincidence that it’s also the home of Art Bell, the late night talk show host on AM who specialized in the ‘froofy’ side of things on the grandest of scales, is pretty funny. MAYBE IT’S A CONSPIRACY!?!? lol! That’s right! LOL! It’s far too easy to forget Art Bell… I’ll bet you he’s a golfer?